First, let us define the subtle but important differences between a startup and a small business. A startup is an organization motivated by solving a consumer problem, at a scale larger than the sum of its parts; this typically means that its offering is relevant on a regional, national, or even international scope. It is also in the search for the business model, rather than the implementation of a known model. A small business, on the other hand, is built on the premise of solving a consumer problem, but is typically done on a scale that is local in nature. It’s also not necessarily inventing a business model, but instead implementing something that it is known to work when executed properly. On the other end of the spectrum, a small business in Tulsa, such as a local coffee shop, crossfit gym, or an accounting firm, would all be examples of small businesses. In each situation, their value is far more proportionate to their inputs, such as time or facilities. And most importantly, none of them are guessing as to the worth of the business model. Society knows we need coffee, workout locations, or bookkeeping services. There’s obviously still tons of risk associated with starting a small business, but there are far less guesses being made when getting a small business off the ground than a startup. Let it be noted that both can be incredibly lucrative – but from an educational standpoint, they look deceptively more similar than they should. In other words, it’s not right to start one versus the other; the only thing that would be wrong would be to not understanding which type you’re starting, and then study the other type (or to study neither). BetaBlox works mostly with startups – or sometimes small businesses that have innovated the business model for which their small business is built upon. What most modern investors forget is that “small businesses in Tulsa” can grow into giant companies. Would they have not invested in Starbucks, 24HourFitness, or McDonalds when they were just getting started? Of course they would have. Yet too many “experts” would run from the hills if they saw a coffee shop, gym, or restaurant in their inbox. It’s important for both to recognize which one of these they are, and to mostly study leaders within their camp – but never forget that at least a small percentage of their studies should be of the inverse methodologies. A small business that doesn’t at least sorta study what works for startups; or a startup that doesn’t at least sorta study what works for small businesses – is leaving money on the table. In athletics this would be like not learning training techniques from other sports. Yes, you should mostly study your own sport. But that doesn’t mean that you can’t learn a thing or two from other disciplines that your competition isn’t paying attention to. What follows is a list of the things startups can learn from small businesses. 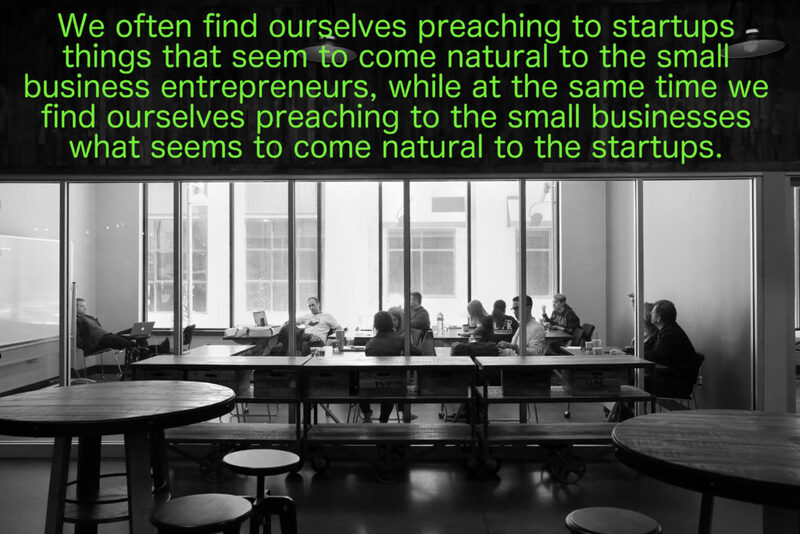 And remember, you can find the inverse of what Small Businesses Can Learn From Startups here! Don’t get us wrong, there is a time and place for certain startups to use branding, storytelling, and creative financing to magically move their valuations north despite a lack of real traction. But most every entrepreneur that goes down this path will fail miserably. The disciplined strategy should be to attack revenue as early as possible. Small businesses seem to get this without any help. No bar owner ever says to themselves, “I’ll give away my beer for the first three months to take more market share.” Never. They open their doors, and they sell their beer, on day one. That cash flow slows the bleeding as they get their company off the ground, sustainably. Well, that’s not what a lot of startups do. They attempt to build an entire business that must become successful before their secondary business even attempts to sell. It’s the whole, “we’ll monetize it with ads” approach, and it stinks. This is what Facebook and Instagram did, thus it feels like the answer. But it seldom is. Early revenue elongates runway. The longer your runway, the better your chances of success. Early revenue gets you press and investors, which further fuels your revenue generation. Revenue is the driving factor behind your company’s valuation. Without it, you’re less likely to ever be offered acquisition or merger opportunities. Revenue is momentum, and momentum is a startup’s oxygen. We don’t care how creative you think you’re being; if you’re not selling something from the jump, you’re probably making a mistake. Picture a kid that wants to build a lemonade stand. She doesn’t raise money every time she has a birthday to eventually build the best lemonade stand ever. She doesn’t launch with every kid in her class under royalty agreements in exchange for working their individual neighborhoods. She simply hauls a table to her front yard, steals some sugar from her parent’s cabinet, and draws a sign with the price. Although this cheesy example is meant to emphasize the importance of small but important steps, let’s really put this in perspective. This little girl, on day one, makes more money than 99% of startups do in their entire first year post-idea. Startup entrepreneurs inundate themselves with grandiose steps. They think that entrepreneurship is about risk tolerance, and thus the best entrepreneurs take the biggest risks. Those risks often mean being okay with being in stealth mode for months or years as they build something they haven’t proven anyone wants. They’ll invest months of time attacking a particular strategy that has no data indicating they’re on the right path. Startups need to realize that their job isn’t to scale the mountain, but instead to build the mountain themselves, one small rock at a time. They need to be okay with accomplishing seemingly insignificant tasks, for they’re not so insignificant once they’ve been added together. Think big, but build small. Then add. Eventually your business will be as big as the original vision. But trying to build for such at the beginning will all but ensure you’ll never get there. Entrepreneurs aren’t risk takers, they’re calculated risk takers. There’s an important delineation. It’s as profound as the difference between a poker player that views it as gambling, versus a poker player that views it as a math problem. That second level of Mario on the original Nintendo really did a number on a lot of startup founders. You remember the one. . . you could hit a brick at the beginning of the level and jump on the roof and just run through the whole level without ever having to kill a turtle or hurdle a smoldering pit of lava. Well, startups often feel like there is such a trick to bypass arduous steps altogether. They get frustrated when they’re not featured on TechCrunch or raising millions of dollars in their first year. They insult banks; they insult investors in the Midwest for having a low risk tolerance; they insult the press for not featuring their plight on the front page. They don’t seem to understand that banking, investors, press, and things like it are all accumulated by people who put in the work, one small step at a time. They let headlines delude them into believing that there are such things as ‘overnight success stories.’ There’s not, and believing so is dangerous. Don’t let entrepreneurship memes and motivational Instagram pages fool you. We’re not economic geniuses. In fact, we’re bigger societal chumps than our colleagues that work for real companies. We don’t have one boss, we have an infinite amount of them. They’re called our customers. They can fire us; they can give us raises; they can also give us the qualitative feedback required to better serve them and thus all of their network. Startups tend to hide behind their computers too often. They think that listening to a customer’s complaint “isn’t scalable”. But the truth is that a startup won’t know what to scale until it’s been in the trenches and won that data the hard way – one customer at a time. Eventually those practices will need to be scaled, and partially automated, but at first it’s more than acceptable to cater to individual customers. In this world, you won’t get what you don’t ask for. Small businesses know this. They ask to be paid. They ask for feedback. They tell their social following to show up to their store. They design their facilities to guide customers through them in an order for which they’ve identified will be the most beneficial. Startups tend to completely forget to ask for what they want. Their calls-to-action are ambiguous, or missing altogether. Granted, competition is an important variable in entrepreneurship. The most important reason is it helps the company learn what others are doing so they can differentiate themselves from the noise. But after that, the good ones simply open up shop and start fighting. If gyms, coffee shops, or accountants worried as much about competition as startups do – Tulsa or Kansas City would only have one gym, one coffee shop, and one bookkeeper. Startups forget that what they gain by attacking such large markets is that there is more than enough room for multiple, if not many, players in the game. Don’t think this is advice telling you to copy, for it’s not. Simply differentiate yourself. Emphasize said differentiator every chance you get. And tweak your offering based in your customers’ actions, not your competitors. Even if competition is a larger problem than we’re making it out to be, their kryptonite is your speed – and speed cannot be attained by being worrisome and reactive. Remember, there’s an entire other essay profiling the things small businesses can learn from startups. So please don’t read this and decide to move your software to the recycling bin so you can build a bar. Just try your best to every once in awhile, think long and hard about how a small business entrepreneur would improve upon your company. It’s a healthy exercise that will keep you disciplined in more places than you might realize.